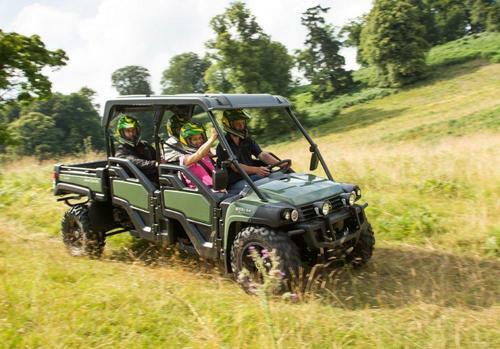 A special interest-free finance programme is now available to anyone ordering a new John Deere XUV 855D S4 Gator 4x4 utility vehicle and any John Deere Gator attachments. The scheme, which runs until further notice, is based on 60 per cent of the recommended retail price, with purchasers able to make 1 + 2 annual payments at zero per cent interest. The new XUV 855D S4 Gator makes its UK show debut at BTME 2014 in Harrogate this month (on main stand no. M58), where it lines up alongside other new machines from the John Deere range. These include the X950R commercial rear discharge/rear collect diesel lawn tractor – a first for the company – as well as pedestrian and ride-on cylinder and rotary mowers, compact tractors and quality parts. This latest Gator model is available in olive & black livery, and can be ordered with a variety of factory and dealer installed options and attachments. The proven 22hp three-cylinder liquid-cooled diesel engine delivers a top speed of 32mph, and power steering is standard. The S4 combines versatile off-road performance, work capability and comfort for up to four passengers. To allow for extra passengers or cargo space, an easily convertible rear bench folds down to provide a flat surface for extra storage. A spacious under-seat storage compartment is also included. Cargo box, towing and payload capacities are 454kg, 680kg and 635kg respectively, and the XUV 855D S4 Gator also features true on-demand four-wheel drive and fully independent suspension. The vehicle’s base UK list price starts at £14,593 (plus VAT).